Whenever anyone comes over, I hear the same polite but curious question: So how long have you lived here? Why do they ask that? Oh, because there is hardly any decor on my walls! I know, complete blogger fail, right? 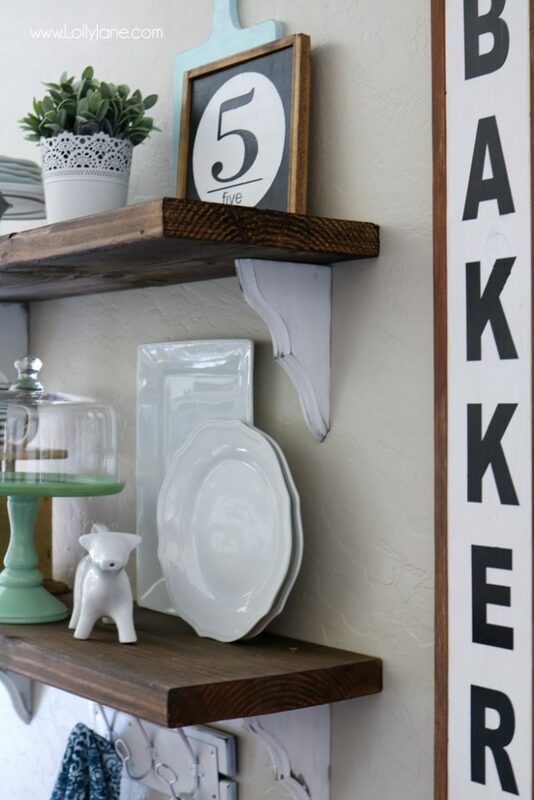 Well I decided (conveniently when my husband was out of town for a week) to spruce up our dining room with some quick DIY farmhouse shelves and add a twist of modern decor (his preference) among my more rustic, vintage decor, (my preference.) 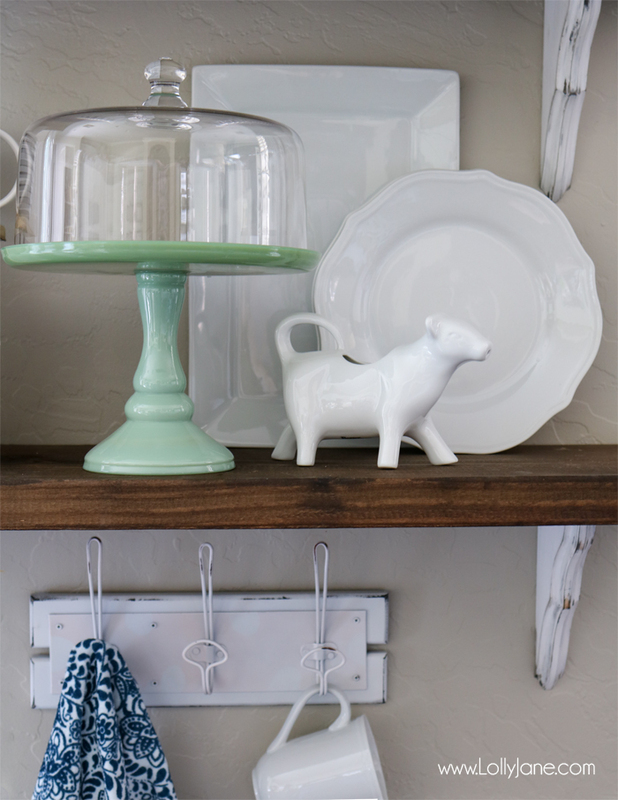 I ended up with these easy farmhouse chic dining room shelves… which, by the way, he loved! Before we had a single over sized clock that actually looked much smaller. I love that the sign pairs well with the shelves, color wise. Did you know Walmart carries wood corbels? Their online selection is totally rad and I snagged these with a few clicks then had them delivered site-to-store within a few days. Here’s what the shelves looked like before their hair and makeup… and by “hair and makeup” I mean paint and stain! 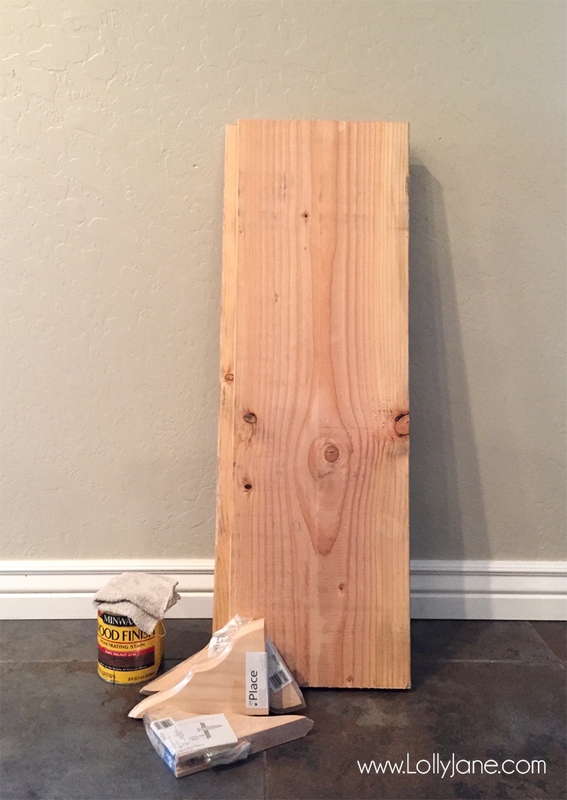 Snag the easy tutorial on these DIY Farmhouse shelves that were a breeze to refinish and were ready to hang in a few hours. I love that pieces from the Better Homes and Gardens line can be farmhouse or modern alone but together they mesh into a beautiful decor pallet of farmhouse chic. It was fun to mix these pretty pieces with my rustic shelves and elegant prints that really pull this whole look together… I’m all about texture and this whole space has a lot of it! 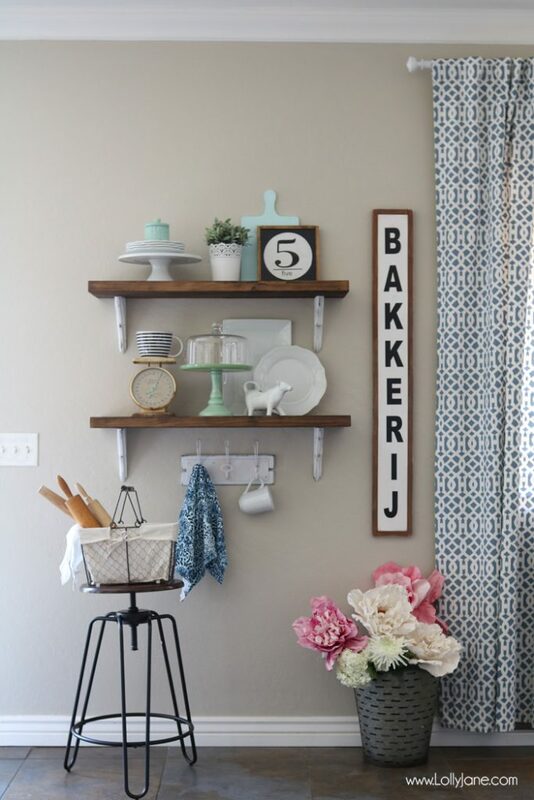 One of my very favorite things to do is to mix old and new so my thrifted rolling pins at a local antique shop here in Phoenix were perfect for this space, as is the vintage olive pail that holds pretty flowers. I was gifted the old scale from our older sister as a thank you gift when she was in Pennsylvania antique shopping and I can only imagine how many hands held this piece to make its way to its forever home! Walmart Striped Mug (in store only), similar one here. Walmart Aqua Ceramic Canister (in store only), similar one here. Previous Post: « Born to stand out flamingo print + party ideas! Wahoo! We’d love to link up, parties are our fav!! Thanks for the sweet words, Kathryn!! Hello perfect shelves filled with awesome stuff! I see several things that I need and what! 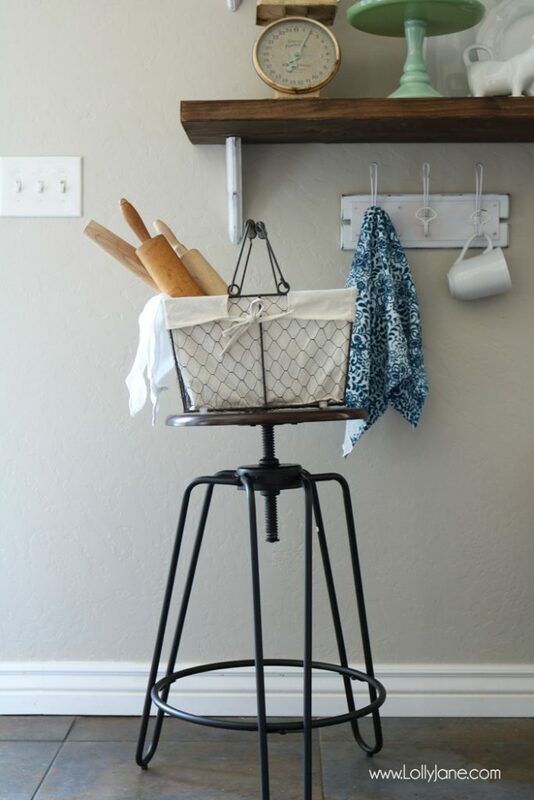 that stool…news to me! Love it all! Get it, girl! You’ll love it, Marie! Beautiful! 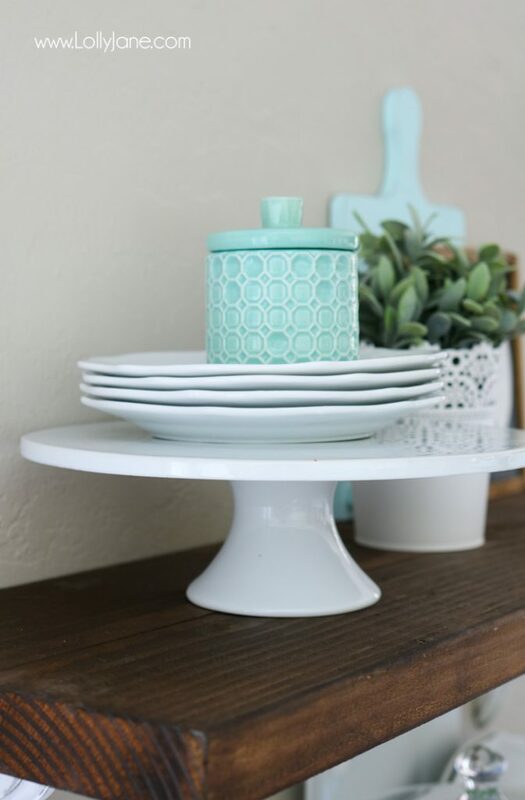 I absolutely love how you’ve styled the shleves – white, mint green and turquoise – perfect! 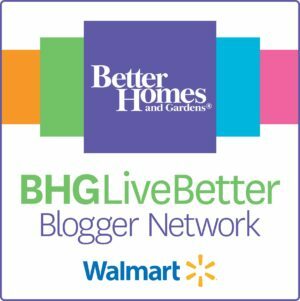 I hadn’t heard of the Better Homes and Gardens line at Walmart! Looking forward to checking them out. Oh Neelam, check it out, girl!! Just bought 4 towels and 2 rugs from them this morning. GOOD STUFF! Thanks so much, Lane and Holly!! What about the “5” sign?? I’m crushing on it!! Love the shelves! So cool! such pretty decor! Thanks, Shawnna! I’m so happy to have FINALLY put some decor up…since I moved in almost a year ago, lol! Where did you find the clock? Love the shelves. Love your decor and arrangements. So cute! So many cute touches and wonderful things to look at. Love your blog, chose y’all as my featured blog. Thanks for sharing at the Talk of the Town Link Party. Umm, I LOVE these shelves. I can’t wait to have a house sometime next year so I can do something similar. This is exactly the style I’m going to go for! I love your design! 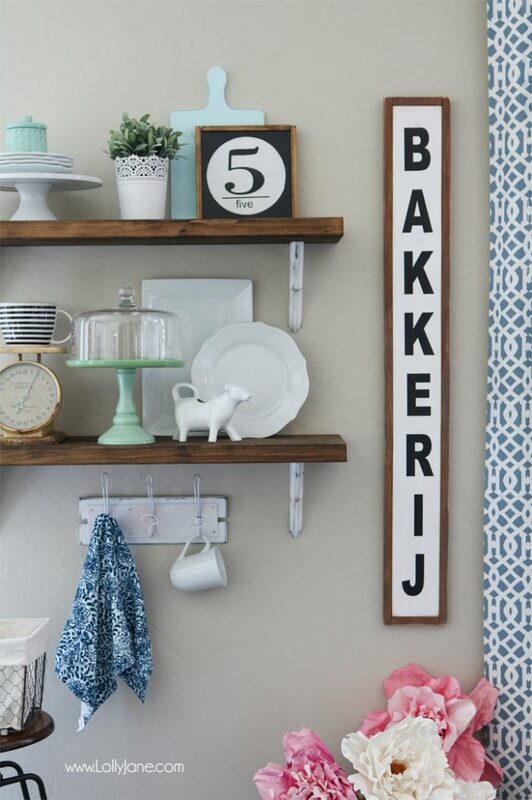 My favorite is the Dutch sign…that’s so cool and is a great way to add a little family history. Not to mention it must be a great conversation piece! This looks so good! I’m always on the hunt for farmhouse style inspiration! Just gorgeous!! And that scale with it’s aqua hand…girllll…I love it all. So very glad you linked up to Talk of the Town! I love everything about this, including how easy it looks! Visiting from Frugal Mommas Link up. I LOVE Farmhouse decor. 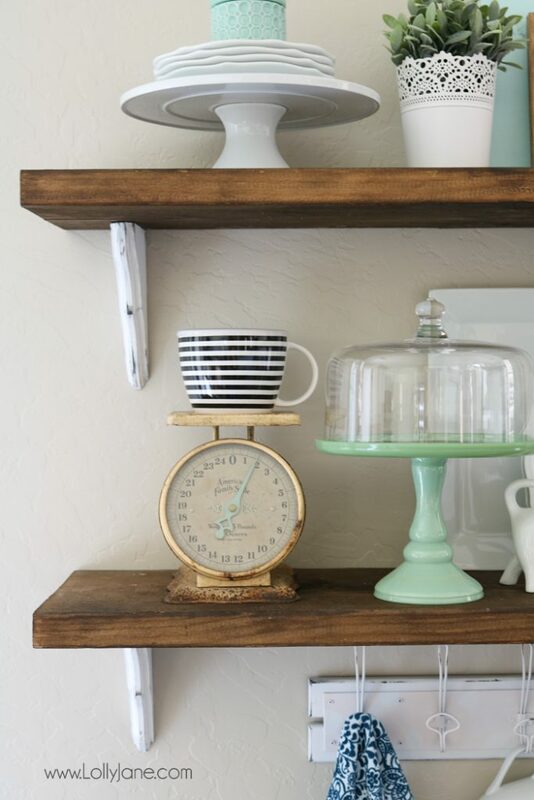 These look great…shelves are one of my favorite things. Omg! I am farmhouse obsessed. Love these shelves. I absolutely adore all your accessories and how you put them together. I use to be very good at math, but centering on the wall and then subtracting the width of the shelf, centering that and on and on and on…..
Good for you for persisting and asking for help. I would have been using green painters tape and then saying,, yup looks good. Your shelves are gorgeous! Thanks for sharing at Meet up Mondays. Aww, thanks, Angela! Love your party! It’s gorgeous! I’ve got some shelves that I’m getting ready to redo and some to add so thank you so much for this inspiration! I love the affordable prices which help to make this look a reality for so many. I hope you come back to visit us at Let’s Get Real often. Affordability is key! Thanks, Christina! Really beautiful, clean design, love it. I love this wall full of lovely things!! 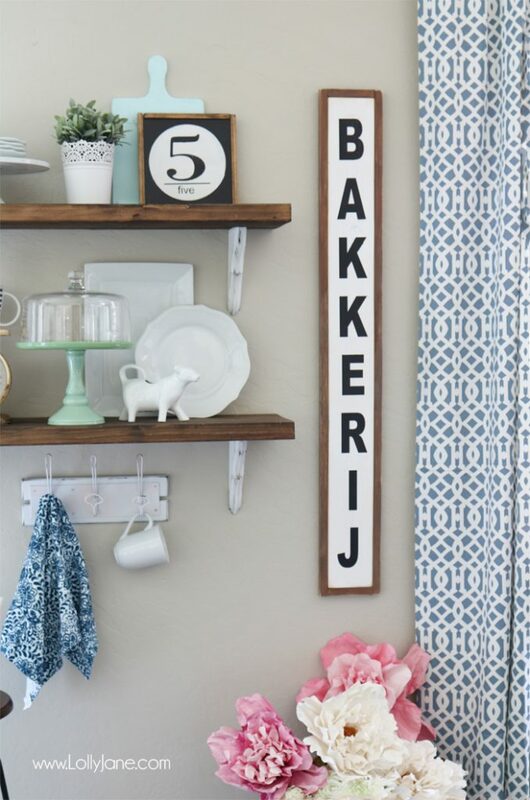 Those shelves and signs are awesome!! I like all the texture and pops of color. This looks wonderful! All of the elements combine so wonderfully. 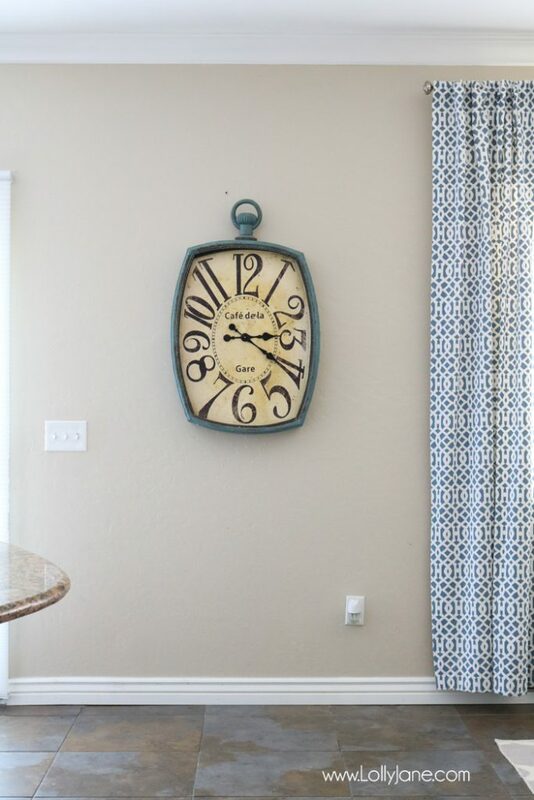 It’s a lovely focal point in the room Pinning. Thanks for sharing at Snickerdoodle! Oh my heck! So cute! I’m in love! How deep did you make your shelves? ! 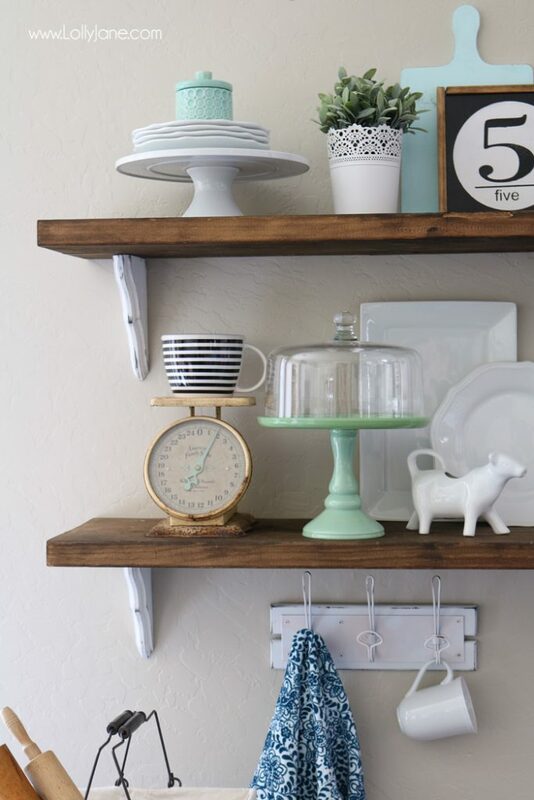 This seems so much easier than the floating shelves I was going to attempt haha! Love everything about this! Thanks for the inspiration!